Presented here, a RARE Betty Lamp Stand made of Tiger Maple dating from the early to the middle years of the 18th Century, found in Chester County, Pennsylvania. The Tiger graining is wonderful! While beautiful in its simplicity and utilitarian in nature, it is a functional item elevated to Folk Art due to the special touches that move it to another level beyond its utilitarian nature. It has a two part stepped plinth base. The bottom of the upright is turned and tennoned into the base with a wedge driven into the middle of the bottom to keep it tight. 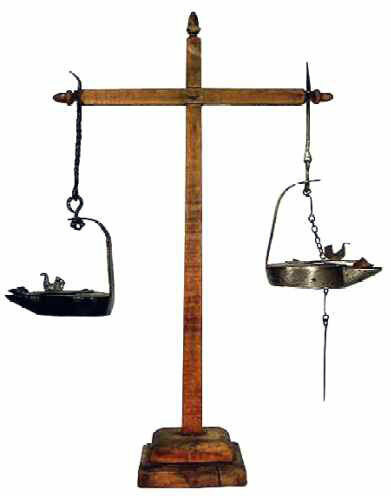 The upright is tapered and both the upright and the cross member are half-lapped to allow them to fit flush with each other. What is very special here is that the finial on the upright as well as the terminals on the cross member are turned into perfect little acorn shapes, lending a touch of elegance to this rare, period piece. Both the top piece and the cross member are secured with tiny square headed nails. The lamp stand is the perfect height to display your betty lamps or crusies. It measures 17 1/2" tall x 10-1/2" wide. 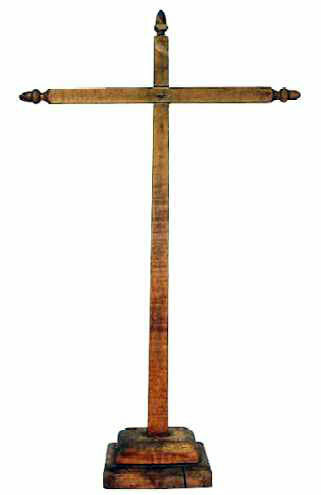 This, a fabulous piece of treen for the collector of early lighting, treen, or just beautiful things. According to Caspall in Fire and Light . . ."It was certainly more usual for oil lamps to be suspended from elegant wooden standards of this type in American homes than in the European ones, and therefore it would not be unreasonable to label the device as truly American."